The hockey season is approaching its pinnacle point--the Stanley Cup finals. But first, we need to figure out which teams are going to proceed to the finals. With the first round all but over, let’s look back how accurate Accuscore predictions have been at the start of the NHL playoffs. When betting outright winners in moneyline markets, 100 dollars in 42 games played so far have converted to 900 profit so far. Any bettor would take that. Another 400 dollar profit has been recorded by betting the same games on side value bets. In Europe, hockey leagues are in final stages. During the regular season and also in playoffs, the best profits have been recorded from totals betting. KHL provided a playoff profit of 500, while Liiga in Finland scored profits of 210 during the playoffs. Many of these players will head to ice hockey World Championship starting next week. Accuscore simulates every game from this tournament, as well. As a reminder, AccuScore recorded profits of 870 and 190 dollars from side value and totals betting, respectively, in the 2017 World Championships. Not a member? AccuScore membership includes predictions, trends and expert analysis for every game in every major sport worldwide. If you're new to AccuScore, you can qualify for a Free 7-day trial. AccuScore is the most trusted predictions service, having worked with ESPN, Yahoo Sports, the Wall Street Journal, Turner Sports and more. Regardless of whether you're old or new, register using the coupon code NBAPLAYOFFS and get 25% off membership: Join Today! NBA playoffs are in full speed as well. Golden State and Philadelphia proceeding to the second round were not surprises, but the New Orleans Pelicans 4-0 swept over Portland wasn’t included into most predictions. So far, the best betting results based on Accuscore predictions have been seen in side value betting. Even though some favorites have been struggling, we have been able to secure 91 dollars profit in playoffs. This is expected to be increasing, because simulations will catch up hot teams better during second round of playoffs. Baseball season has been struggled with cold weather in many places since start of the season. However, bettors who have followed Accuscore moneyline bets have been hot during the last week. With 100 bet for every MLB game during the last seven days, 1414 dollars profit have been recorded. That would keep you warm for a while. One nugget from totals betting is the trend of Washington Nationals playing on the road. Accuscore has predicted 10/11 correct of these game totals. The Major League Baseball season started few weeks ago, and the Boston Red Sox have been red hot with only two losses in 11 games, but how hot have Accuscore's baseball picks been during the first few weeks of the season? Notably, games when the home team favorite had over -130 odds have been profitable when simply betting moneyline as well as side value. You would receive profit of 282 and 439 dollars, respectively, when betting 100 for every game. While baseball season is just taking its first steps of the season, the NHL is into its postseason. After 1270 regular season games, Accuscore's NHL Picks generated overall profit with side value and moneyline bets. By betting 100 dollars for every game the profit of 495 from moneyline markets and 392 from side value bets may not seem staggering, but an overall profit entering the playoffs is always a positive sign for the playoffs. In addition, season totals bets also generated profits. Another league that changes gears to the postseason mood is the NBA. AccuScore's NBA Side value bets generated a profit of 1,363 when every game was bet by 100 units. Also, totals wagers generated profit during this regular season. A decent 390 profit out of all games when betting total based on Accuscore predictions is always good in your pocket. With a full season of data to fuel the projections and both sports profitable, NBA and NHL playoffs look set for a strong postseason, and NBA playoffs picks should be updated regularly. Soccer leagues in Europe don’t have playoffs in the traditional sense, even though the seasons are winding down across the continent. We have been very happy with the accuracy of our predictions since start of the season in August. The total profit of $32k with 100 dollars per every game in totals and 20% side value is something that anyone would welcome. During the last month, Serie A Picks continue to be the best performing league predictions in Europe. This time, the profit count during the last month is 1,078 when all side value bets and totals bets from every Serie A games were summed up. Overall, the accuracy of Serie A game predictions has been very good as the season totals shows over $10k profit for all of totals and 20% side value bets. Finally, AccuScore has predicted every Champions League game since group stage was completed. In these 24 games, few great side values in Manchester City losses against Basel and Liverpool have built up a great profit. By betting 100 dollars in every game’s side value, the profit number currently stands at 3150 dollars! Total bets from these same games have added another 328 dollars to the same profit column. With only five matches remaining in the Champions League, we're looking for these profits to continue to grow through the semifinals and final. Not a member? AccuScore membership includes predictions, trends and expert analysis for every game in every major sport worldwide. If you're new to AccuScore, you can qualify for a Free 7-day trial. Regardless of whether you're old or new, register using the coupon code NBAPLAYOFFS and get 25% off membership: Join Today! The Houston Rockets and Golden State Warriors kick off the Western Conference Finals on Monday, and many people consider this series effectively the NBA championship. 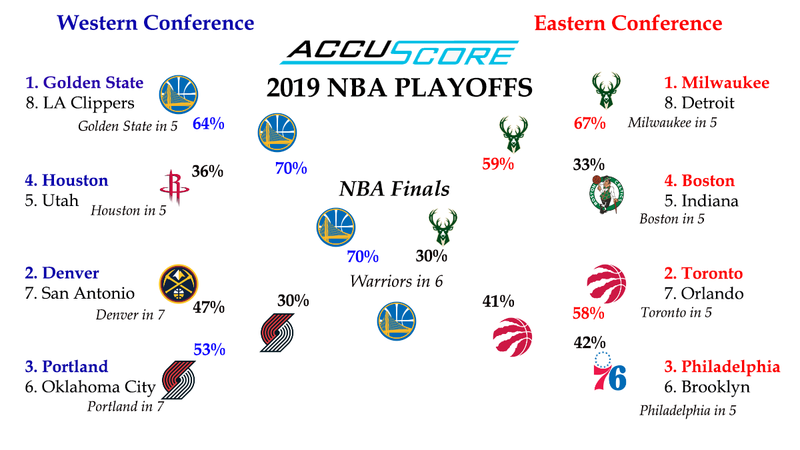 Well, AccuScore’s computer has a pretty strong stance on who will win this series with the Golden State Warriors winning 70.1% of AccuScore’s simulations. The Houston Rockets aren’t exactly hopeless, but they’re facing long odds. To put into perspective the gulf between the Warriors and the Rockets, the latter of whom finished the season with the best record in the NBA, the Warriors have a 39.1% chance of winning the series in either four or five games. As a reminder, the Rockets only have 29.9% chance to win the series in any manner. In fact, the longer the series goes, the better the chances for Houston to pull off the upset. The Rockets have a 14.2% chance of winning in 7 games versus the Warriors’ 13.5% chance to win if the series goes the distance. Effectively, the Rockets’ best chance to advance to the NBA Finals involves playing the Warriors seven times and banking on the home court advantage to carry them through. That said, the Warriors are most likely to win in 5 games at 26.3% with the next most likely outcome as the Dubs winning in six games at 17.4%. To open the series, the Rockets won 52.4% of Game 1 simulations, so Houston is not exactly expected to be a pushover. All the games in Houston expect to be close contests with the Warriors afforded opportunities to win games, while the contests in Oakland fall in an entirely different category. Beating the Warriors four times in seven games with Stephen Curry, Kevin Durant, Draymond Green and Klay Thompson all healthy is going to take some doing. Ultimately, AccuScore calculates that the probability of Houston beating the Warriors four times in a series is about a 30-70 split, with Golden State the clear favorite. Not a member? AccuScore membership includes predictions, trends and expert analysis for every game in every major sport worldwide, including the 2018 World Cup. If you're new to AccuScore, you can qualify for a Free 7-day trial. New or returning, use the coupon code NBAPLAYOFFS and get 20% off membership: Join Today!